"Excitement...Danger...Suspense...as this classic adventure story sweeps across the screen!" "Welcome to Sherwood Forest!" Errol Flynn stars as the famed bandit king of Sherwood Forest who romances Maid Marian and leads his Merry Men in a battle against the corrupt Prince John. Co-starring Oscar-nominee Basil Rathbone, Oscar-winner Olivia De Havilland and Oscar-nominee Claude Rains. Nominated for four Academy Awards (including Best Picture) and winner of three. 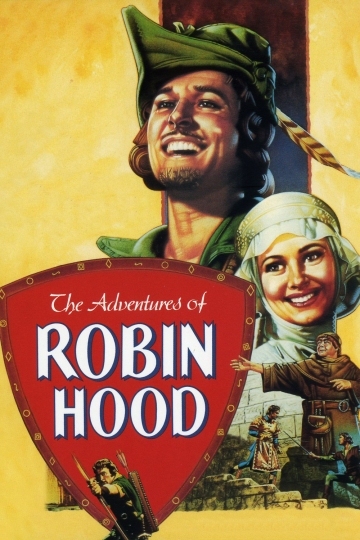 Selected by the prestigious American Film Institute as one of the 400 best American films and listed Robin Hood one of the 50 Greatest Heroes of all time. Inducted into the Library of Congress National Film Registry. The Adventures of Robin Hood is currently available to watch and stream, buy on demand at Amazon, Vudu, iTunes, YouTube VOD online.